Using a vegetable peeler, shave squash into ribbons to measure 5 cups. Discard seeds and core of squash. Grilled chicken would be good with this dish. When I fixed it recently I did all vegetables. It was so refreshing and light! I hope you’ll try this! Even for people who might not love squash, peeling it so thinly is a great disguise! Rosemary Potatoes With a Secret! If you love delicious, buttery, (but still light) seasoned potatoes, but don’t have much time to cook, read on!! Red potatoes are a favorite side dish of mine. They’re my favorite for potato salad. They wonderful in Pioneer Woman’s Hot Crash Potatoes! It’s hard to beat red potatoes roasted with rosemary in the oven…BUT they take a good bit of time to cook in there! I was delighted recently to be thumbing through my Cooking Light Cookbook and find a recipe for Rosemary Potatoes done in the microwave! They came out still moist, not withered up like some things when they’re microwaved. I was so happy with the results, I just had to share this technique with you! I love to have a side dish that can be ready in 15 minutes and taste like you’ve been working on it for an hour! I made these potatoes for Sunday dinner – a day when we come home from church ready to eat! This meal was so fast! I had a package of honey-glazed ham in the freezer, so I warmed up slices of ham, cooked my green beans on the stove with this method and popped the potatoes in the microwave. In FIFTEEN minutes dinner was ready! That’s faster than we would have been seated at Cracker Barrel! This recipe is a keeper! Place butter and garlic in an 8-inch square baking dish. Microwave at MEDIUM-HIGH (70% power) 45 seconds or until butter melts. Add rosemary, salt, pepper, and potatoes; toss well. Cover and microwave at HIGH for 15 minutes or until potatoes are tender. (Mine took a little less than this). I hope these pictures make you hungry for roasted red potatoes and you try this recipe! All you need is 15 minutes (or less!). What kind of potato is your favorite? And are you like me, and want to throw an “e” on the end of “potato?! !” What in the world?? Oh well…. If you love Mexican foods the way we love Mexican foods, the title of this recipe alone will draw you in! I mean what could be wrong with combining a fajita and a burrito? You have the sauteed vegetables, the rice, the fresh veggies and sour cream and cheese…yeah, you know what I mean! This past year I was introduced to the Burrito bowl. You take all the stuffings of a burrito and eat it out of a bowl rather than a tortilla. What a great lunch idea! I usually always have all the ingredients for this recipe on hand, so it’s a perfect addition to my menu! Heat a medium sized skillet with vegetable oil and onion and peppers until cooked through. Add the beans, corn and all the spices and sauté for few minutes more. The bowl below might look like a bowl of mush, but it’s soooo good! Have you ever had a burrito bowl? What did you think? I hope you’ll give this meat-free recipe a try! Enjoy! Happy Monday and Post #4 about Successful Sunday Dinners! I’m posting late today because I got home from Michigan very late last night and couldn’t finish this post until today! I can’t wait to tell you about my special weekend, but let’s move on with Sunday dinner! Today I’m going to give you some 30-minute meal ideas for Sunday’s. Sometimes having a meal in the oven or crock pot isn’t feasible, so these menus are a great option! As with any other menu, you should still prep anything ahead of time that you can. You may even reduce the time to under 30 minutes! Set the table ahead of time. Stir Fry – Stir-fry is cooked very quickly, making it great any time you’re in a hurry. This recipe for Orange Chicken was new to me and we loved it! I used her Original recipe she mentions, because I wanted lots of orange flavor! It was super good! This picture does NOT do it justice, so please try it anyway!!! Waffles – How about making these waffles up ahead and freezing them. Then after church, toast as many as needed and having all kinds of fruit toppings for them! Add a side of bacon and you have a great meal! 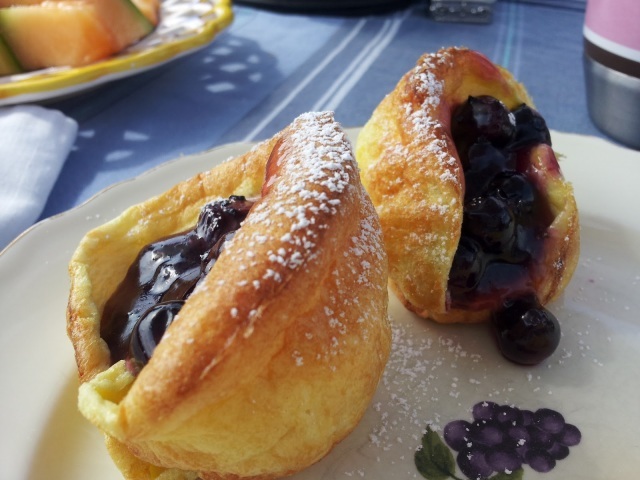 German Pancakes – These are a nice twist on regular pancakes and they are soooo good! Roasted Vegetable Fritatta – This egg dish is full of great flavors and would be another good make-ahead kind of Brunch dish! So, step out of the traditional Sunday dinner mold and fix a new kind of menu for your family after church. This could become a family tradition that everyone prefers! It’s certainly one they’ll all enjoy! Who doesn’t love waffles and pancakes?! I hope these dinner ideas are helpful for you. Let me know if I’m aiding your abilities, or if I still need to address other areas for Successful Sunday dinner! Have you heard of Dream Dinners? You can check out this video if you’re unfamiliar. The basic idea is that you go to a Dream Dinner store, where they have prepared ingredients for you to assemble meals into freezer bags to make up complete dinners for your family for the month. I heard about it through a gal I watched on You Tube. While I’m sure it’s really convenient, it can’t be cheap! She also said there were some meals they had they didn’t like and wouldn’t have again. Recently while putting away leftovers from a meal I’d made, I had the idea to bag it together just like I’d seen on the Dream Dinners. I had made Pork Tacos, Refried Beans and Spanish Rice -all from scratch and I had enough for another supper meal for my husband and me, but rather than eating it two nights in a row, I pulled out the freezer bags. I put the Rice in one, the Beans in another and the Pork in another, then I put all the small bags together in a large freezer bag and labeled it, “Pork Taco Dinner.” How great it will be on a busy day to pull this out in the morning and let it thaw, then simply warm it up that evening! It’s better than having leftovers two nights in a row, and it’s better than paying someone twice what it would cost me to fix it! I’ve always been a huge fan of freezing food, but having the whole meal together in one bag is a great plan! I plan on doing this more often! You could simply double whatever you’re making and eat one for supper tonight and put the other into freezer bags for another day. There’s no need to have to do a month’s worth, or even a whole week’s worth at one time! Wouldn’t it be nice just to know you have a whole meal in a bag all ready to eat for ONE day? Start there, then perhaps you can build on that. That’s my challenge to you – see what you can pull together to make and freeze ahead. Have the elements for that meal in one large bag. It will eliminate calling out for pizza, or running up to a local restaurant because you’re too tired to cook. Become your own Dream Dinner maker; it’s really doable, it’s cheaper, and you’ll be making things you know your family loves! My mind is whirling with several ideas. What would you make and freeze?